The easiest way to travel to Under the Bridge is by public transport. The nearest London Underground station is Fulham Broadway (District Line). On exiting the station, turn left and walk along Fulham Road for approximately 400m. Stamford Bridge is on your left hand side. Enter via Britannia gate and walk anti clockwise towards the East Stand of the Stadium. Frequent bus services stop at Chelsea Football Club and neighbouring streets including King’s Road. Taxis are numerous in the area and there is a taxi light at Chelsea FC which allows taxi’s to stop at the stadium. – Follow M4, which becomes A4, over Hammersmith flyover and across two sets of traffic lights. – Take the filter right, down Earls Court Road. Cross the first major set of lights and at the second junction turn right into the Fulham Road (A304). Use entrance to Millennium & Copthorne Hotel approx. 600 metres on the right. – Underground car parking is available onsite, except on matchdays. – From the M1 turn off onto the A406 North Circular Rd at Juncton 1. – Turn off onto the A40 and stay on until the Junction with the M41. – Turn right onto the A3220 Holland Rd. – Follow the A3220 for 2 miles before turning right onto the A304 Fulham Rd. – Use entrance to Millennium & Copthorne Hotel approx. 600 metres on the right. – From the M40 continue onto the A40 and stay on until Junction with the M4. Then as route for North. – Exit M4 at Junction 2. Continue along the A4 for 4 miles until it becomes the Cromwell Rd. Turn right onto the A3220 Earls Court Rd. Then as route for North. – From the M3 turn off onto the M25 at Junction 12. – Continue for 10 miles until Junction 15 at which point turn off onto the M4. Then as route for West. This inspiring venue, holding up to 550 people, is perfect for gigs, press calls, showcases, fashion shoots, live broadcasts, warm-ups, after-parties, comedy nights, corporate events and much more. Stamford Bridge, is more than just a stadium. Discover your complete event venue as we combine 281 hotel bedrooms, a choice of superb restaurants and a five star health club & spa. Two onsite hotels provide an ideal retreat at the end of the day. With 281 bedrooms including junior suites, our Hotels have all the modern amenities to ensure you feel relaxed and at home at all times. For more information please visit the Copthorne and Millennium Hotels website. The Chelsea Club is the ideal place to relax. With a 25m pool, release some stress with a vigorous workout, or join a studio class. If you prefer to be less energetic, pamper yourself with Antara, our spa. Visit the Chelsea Club. Under the Bridge ensures every effort has been made to accommodate disabled patrons. The venue offers flat floor access from street level to the front the access lift into the venue. A disabled toilet is located within. 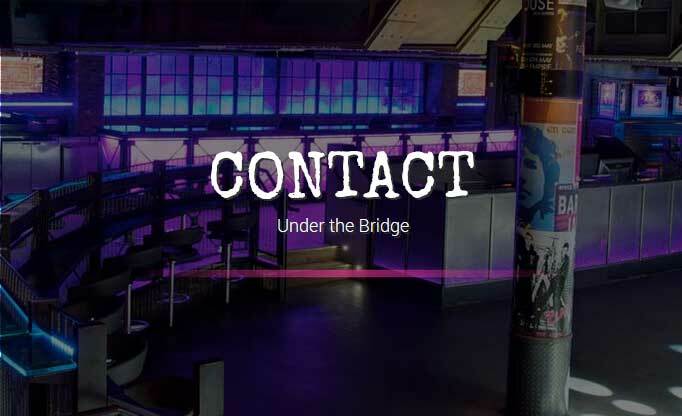 Under the Bridge has a Strictly over 14’s policy to be accompanied by an adult over the age of 21. ID may be required for entry. Each event carries its own age restrictions. Please check the age restrictions regarding shows before purchasing tickets. Unless otherwise stated, all club events are strictly over 18.